We’ve added a QR code feature for Library Anywhere, our mobile product, to tie the mobile site to the regular catalog in a new way. 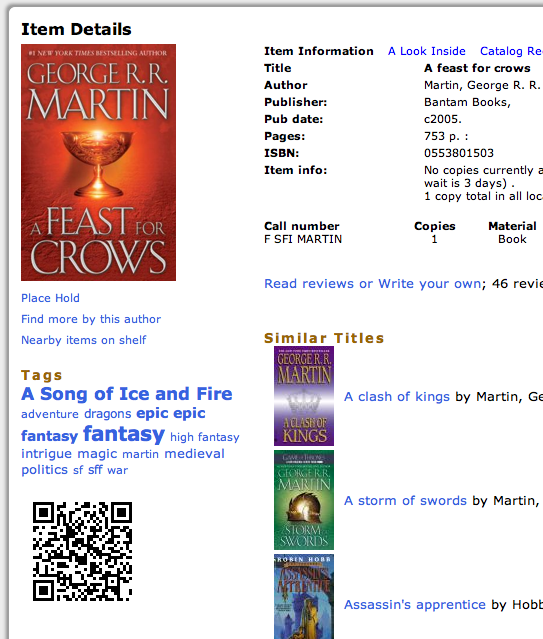 Libraries can include a QR code that LibraryThing generates and dynamically adds to each catalog page. Scan the QR code with a smartphone scanning app (e.g. RedLaser, Scan) and the phone will jump directly to that record in your mobile catalog on Library Anywhere. Then walk into the stacks with the record on your phone, or just add it to your saved list on Library Anywhere. However you use it, it’s a direct link from the desktop catalog to the catalog on your phone. Library Anywhere is now the mobile catalog and website for 130 different library systems, including Ocean State Libraries, Libraries Online, and Wake County Public Library. See all the libraries using Library Anywhere by simply clicking the … menu within Library Anywhere and choose “Select a Library”. Read more about Library Anywhere here. To order Library Anywhere, or get a free trial, call 877 340-2400, or email Peder.Christensen@bowker.com. You can also email questions to Abby@librarything.com. If you’re in New Orleans for the American Library Association conference, come visit us at booth 827. and we’ll show it to you in person! We’ve just added a feature to spotlight certain awards within our Series and Awards LibraryThing for Libraries enhancement. The awards enhancement covers 25,000 different awards and honors—from the National Book Award and the Booker Prize to the Salon Book Award and New York Times Notable Book of the Year, or even Oprah’s Book Club selections. While some books have received one or two different awards, others may have over twenty. By default, we only show the first few (alphabetically) on a book’s page in the catalog, with a “see more” link that expands to show all. 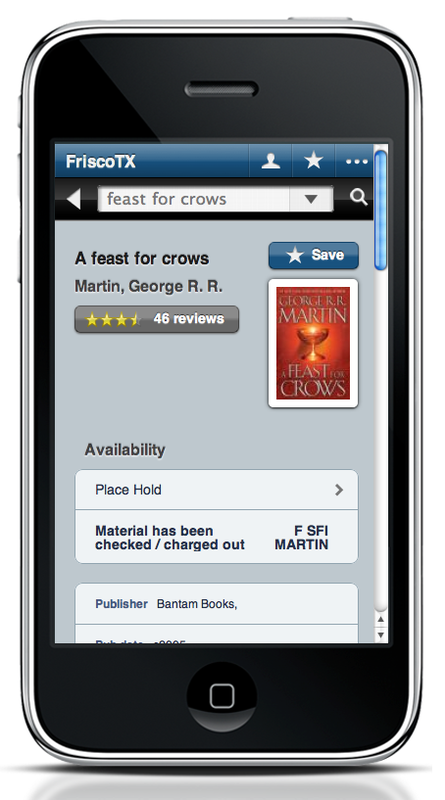 Our new spotlighting feature allows a library to choose certain awards and force them to float to the top of this list. An Australian library can, for example, highlight local awards, that may otherwise get lost in the list. Or perhaps it’s the month when the Orange Prize is picked, and you want to spotlight all the books on the longlist or short list. To use this feature, go to the Series and Awards moderation page within the LTFL admin. Along with the moderation we’ve always provided (don’t think Oprah’s Book Club counts as an honor? Fine, remove it! ), you’ll now see a ‘promote’ button. You can search for awards by name, or browse. Spotlighted awards will always be pushed to the top of the list, and will appear with a star icon next to them. Great as it is, this catalog doesn’t exist. Abby and I are working on new handouts for LibraryThing for Libraries and Library Anywhere. For the former we needed a library that used all our enhancements, including a new one we’re announcing today (QR Codes). Unfortunately, although more than 200 library systems use LibraryThing for Libraries to make their OPACs better (a full list), none have absolutely every one of them today. So we’ve made our own, leaning heavily on the excellent Chemeketa Cooperative Regional Library Service, which has almost all our enhancements. If you’re in New Orleans for the American Library Assocation, come visit us at booth 827. We’ll show you how to make your catalog as good as this one! Or better, because it will actually exist. Oh, and pick up one of our nifty badge thingies. 1. If it had a search bar it would be truly perfect. LibraryThing for Libraries libraries now have the ability to translate the interface of the LTFL enhancements–making them much more usable in non-English speaking countries. The header section had always been editable but this new feature goes far beyond that, finding every instance of English text and letting each library translate the string into a different language, or even just to edit it to their liking. See, for example, the text in the lightbox that opens when you click to read reviews, at this German library in the screenshot to the right. We know that the logical next step is to allow for a dual language interface–switch between English and French, for example–and we’re thinking through how we’ll handle that, but wanted to release this as a first step. To enable the translation feature, click on “Edit/Translate Interface” on the Enhancements tab in the LTFL admin site. Then click “Edit/Translate Interface” under the Configure section, and start translating! We’ve just added support for Aleph and Evergreen. If you’re a library on one of those systems who’s been patiently waiting to use Library Anywhere, let us know and we’ll set you up with a free trial. That means that Library Anywhere now works with all the major (and some minor) OPAC systems, including: III (Webpac and Webpac Pro), Horizon Information Portal, Sirsi (eLibrary, iBistro, iLink, Web2), Polaris, Civica Spydus, Voyager 7, Koha, Aleph, Evergreen, Destiny Follett and Infocentre, and Companion Alexandria. Library Anywhere is now the mobile catalog and website for 130 different library systems, including Ocean State Libraries, Libraries Online, and Wake County Public Library. See all the libraries using Library Anywhere by simply clicking the … menu within Library Anywhere and choose “Select a Library”. Visit our booth at ALA Annual: booth 827 and we’ll show it to you in person! Tim and I will be at ALA in New Orleans later this week, and with three different fancy badge ribbons to give out. So if your badge is feeling a little light and you want some flair, stop by! Booth 827. We also have a slew of improvements and features we’re adding to Library Anywhere and to the LibraryThing for Libraries enhancements–watch the blog this week for more. Lastly, remember, we’re having a meet-up on Saturday morning for anyone in the area! Details in this blog post.